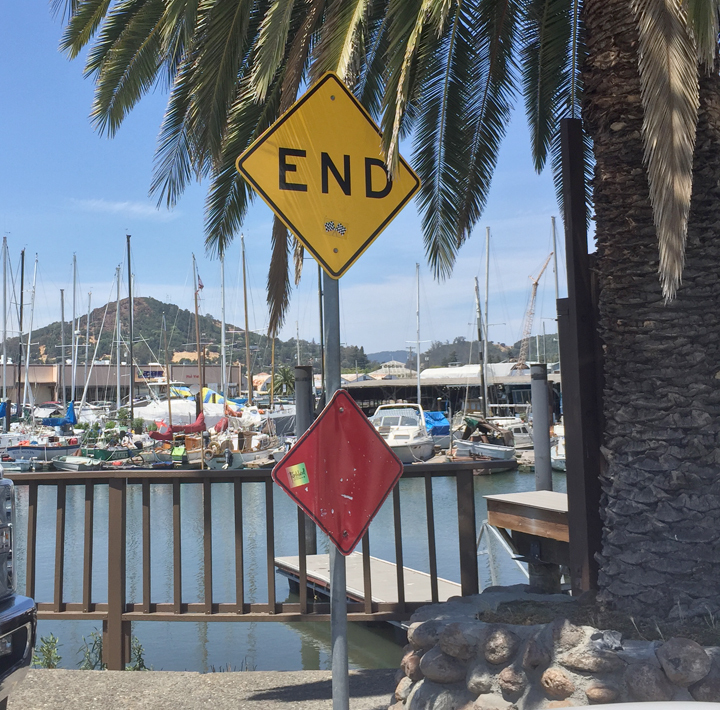 My title for this blog is an old management saying (and not just in industry; a friend who was a petty officer in the Navy said they used it too). But in this post, I’m not addressing that kind of management. Instead, I am going to explain how I use the idea around my layout. I always have a short (usually mental) list of layout work that needs to be done. And mostly that’s fine, because as I slowly work through such lists, things do get done. But there is a risk of focusing on a couple of things that happened to have occurred to you, without being systematic about needs. Those “couple of things” may absolutely be needed, but what else are you missing that is lurking out there? That’s where the “walking around” part come in. 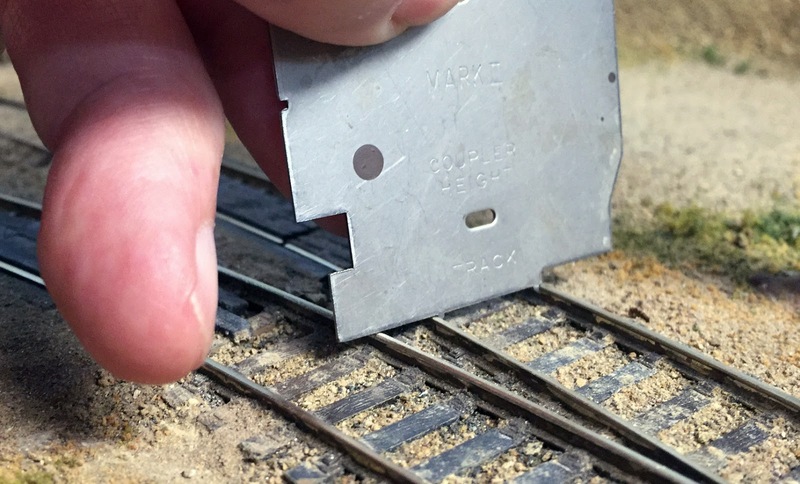 A couple of times a year, I grab a pad of paper or a clipboard, and literally walk around the layout (slowly). Anything needed or desirable or missing or fun that occurs to me gets written down. This is a process just like the classic “brainstorming” directions: any and all ideas that occur to you are to be written down. No ranking of importance, no thinking about how hard or complicated a task might be, just write down all the ideas that pop into your head. 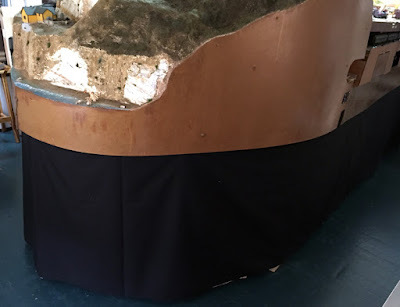 This of course ought to be a leisurely process, allowing lots of time to look at different features and get ideas about what could be improved or completed, and beyond that, of course, as I said, what’s missing. I make every effort to enjoy one of these walk-arounds. Here I’m “on patrol” with a clipboard at Shumala. I often fill a couple of 8.5 x 11 sheets of paper with these ideas. Sometimes I go back around to each one with a clean sheet of paper, and write down more ideas about how a task might get done, or exactly what the desired outcome would be, or whether the task interacts with or has to follow other tasks, and so forth and so on. This fleshes out that first spontaneous list of ideas. 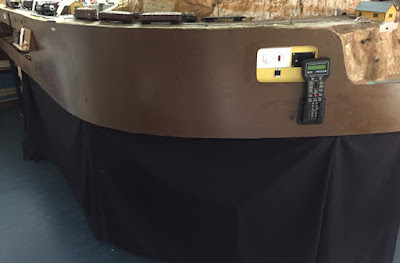 Often I will take photos (cell phones make this so easy) to make sure I will remember the issue in any particular area. For example, I recently noticed that Cienega Creek in my town of Ballard has had the water surface (made with Gloss Medium) get so dull that the creek looks dry (see below). This will be easy to fix with another coat of Gloss Medium. 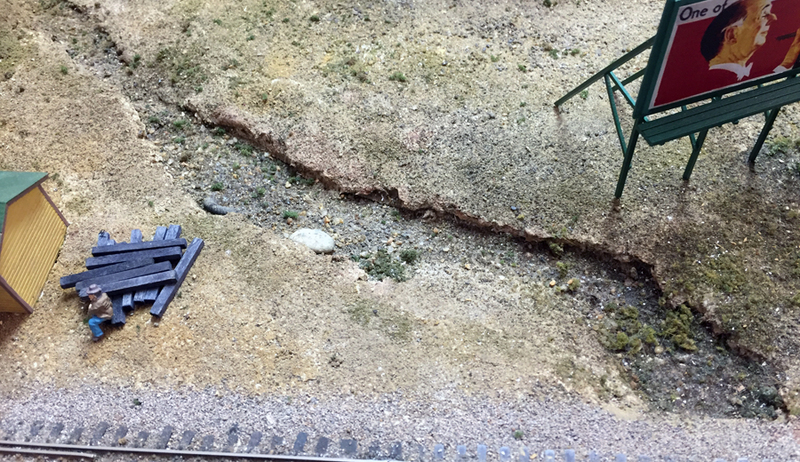 As it happens, I have noticed on any number of layout visits that older modeled waterways have become dull and flat on the surface, which certainly changes the look for the worse. I will fix mine. 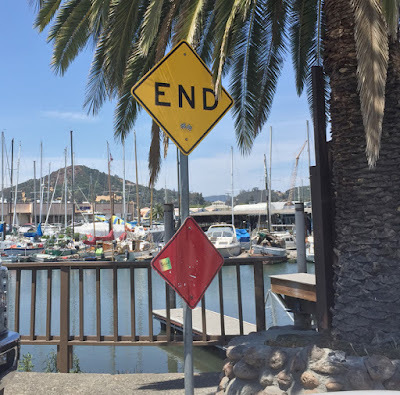 Another example is the end of Nipomo Street in Ballard, which has long needed to have one of those “end of street” signs or barriers. 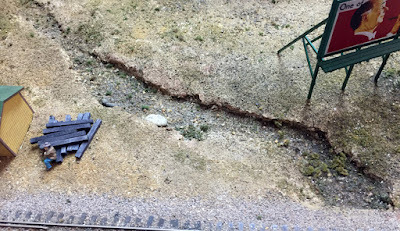 I once imagined using the formed sheet steel barriers familiar as guard rails on highways, but realized for my modeling year of 1953, that a plain wooden barrier was more likely, or, in this case where there is an embankment at the end of the street, maybe just a sign. But to illustrate, here is the area I mean, with the street in the center foreground, and you can readily see that something is needed. 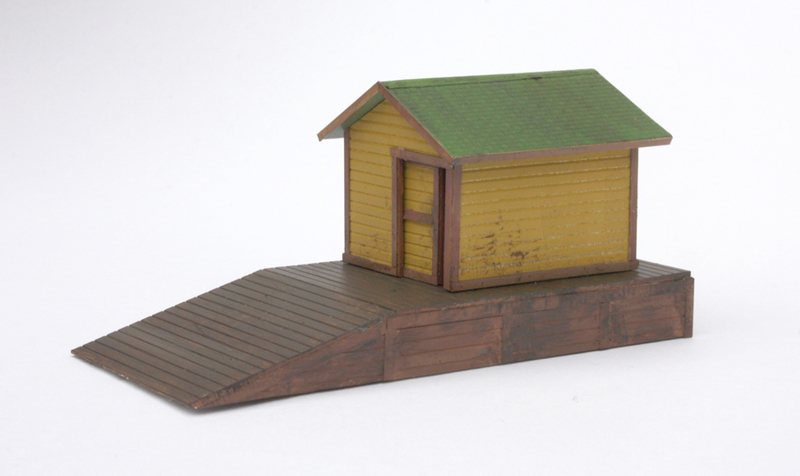 One more example, one that is probably familiar to everyone with a layout more than a couple of years old. 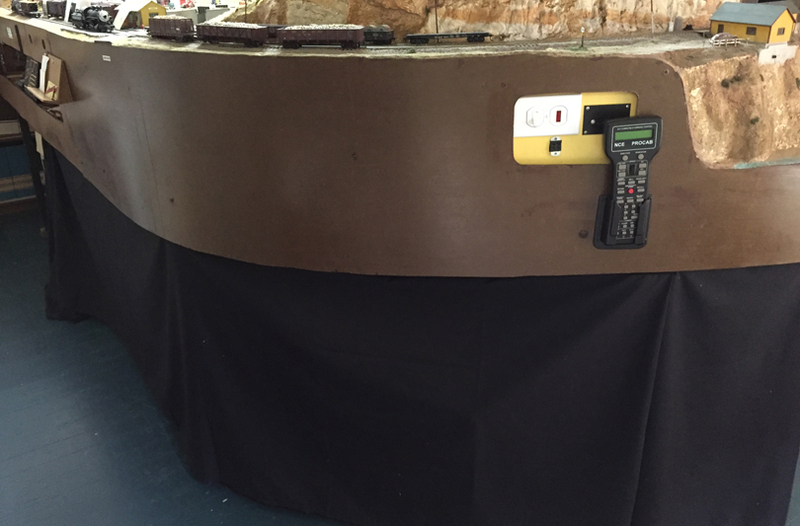 It is inescapable that operators’ hands, along with tools, throttles, and paperwork contact the layout in various places, especially at the edges. This is essentially a kind of “wear,” and though one may try to ignore it, looking with a fresh eye shows it immediately. 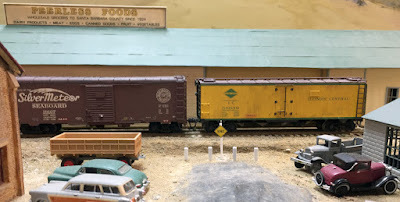 Here’s just one example from my layout, next to the Chamisal Road crossing in Shumala. This was once lush vegetation! (well, kind of). But it needs renewal. 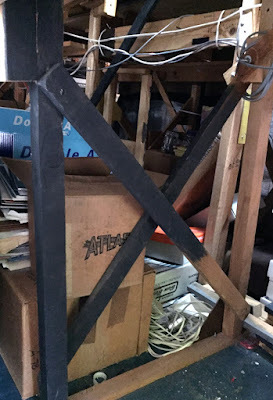 Usually my next step after writing a list, and (perhaps) taking photos, is to put this material aside, because I know from experience that the ideas will kind of “marinate” in my subconscious, and will gain solidity and detail by the time I come back to them in a few days. I may or may not write down the expanded or “marinated” versions, and in fact the marinating process usually will identify some of the tasks as unnecessary or too complex or not compatible with other tasks. That’s fine, they are easy to cross off the list. My final result is usually a three-part list: short-term projects, many of which can be done in an hour or so; medium-term projects, where there may be several hours needed or some preliminary work has to be done first; and a long-term list, mostly fairly big projects or ones which I am not sure yet how to do. Of course, figuring out how to do one of the latter may move it higher in the list. I will confess that one of these “walking around” exercises tends to happen when a layout-oriented event is upcoming, such as a regional NMRA convention where there will be open houses and sign-up operating sessions, and I want the layout to be at its best for that. But I have noticed that if the layout feels a little stale, motivation to work on it is low, other things seem to intervene, then a walking-around exercise often gets me interested again in making more progress. And inspiration, of course, is how you get from benchwork to trackwork to scenery to operating. It works for me. If you ever feel “out of sync” with your layout, you might give it a try. I’d bet you will find a pretty good list of things large and small that would repay some work sessions. 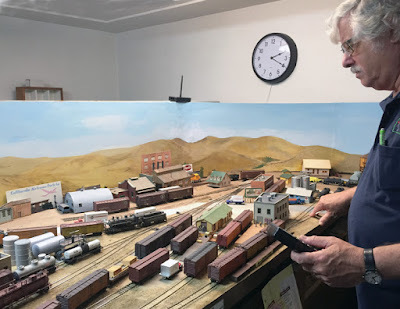 With some experience relating to a “fast clock” (though I have been running it at 1:1) and broadened use of mainline trains during an operating session, I set up two sessions recently, for July 13 in the evening, and on the afternoon of July 15. These newer sessions have the same foundation of switching work as I have been using on this layout for some years, but I am trying to add in some trains on the Southern Pacific’s main line on the layout, the Coast Route south of San Luis Obispo. These sessions ran smoothly. 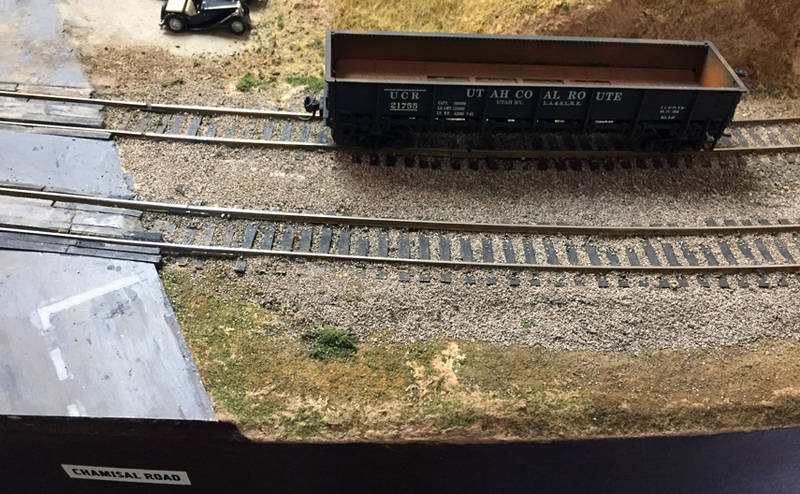 I was able to include a number of freight cars that had not been previously used in operating sessions. Some of them were subjected to the “rookie test” as I described recently (see that post at: http://modelingthesp.blogspot.com/2018/07/the-rookie-test.html ). There were also some variations in waybills and switching patterns, partly just so operators would experience variety, but also so I could see how alternative patterns would work. On the 13th, I did have a late dropout from one operator who had signed up, and I wasn’t able to find a replacement. We then operated with three. 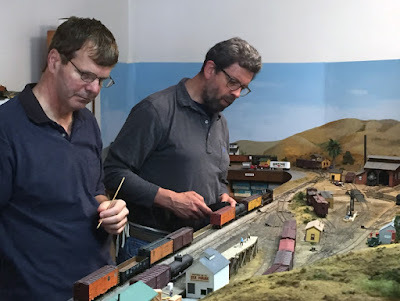 As usual, each crew started on one side of the layout, did the work there, then switched to the opposite and did a second round of work on that side. 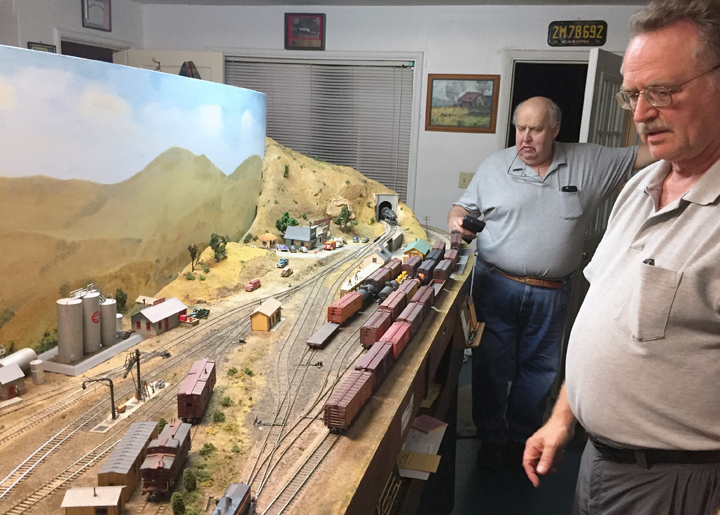 One of the crews was Ray deBlieck (at left below) and Ed Slintak; in this view at Shumala, Ed is the conductor, and Ray is the engineer. I made a couple of small changes to the session plan before the Sunday session, and they seemed to make things run a little more smoothly. 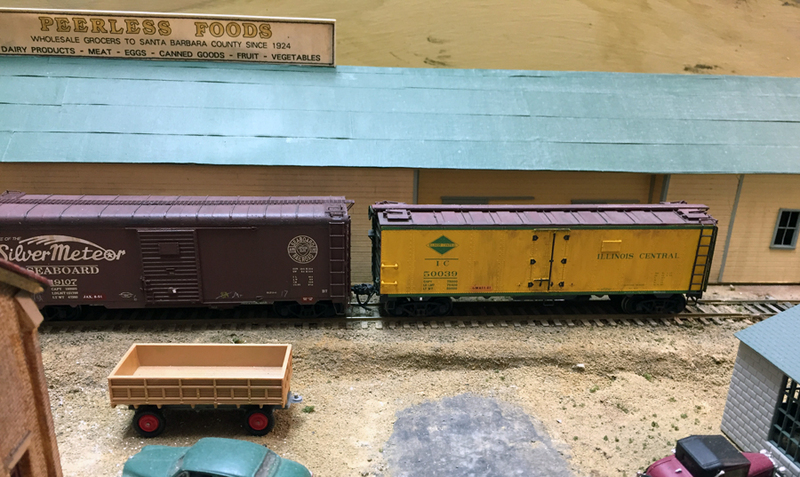 As an example, two through freights (trains 913 and 916) were operated. Shown below is No. 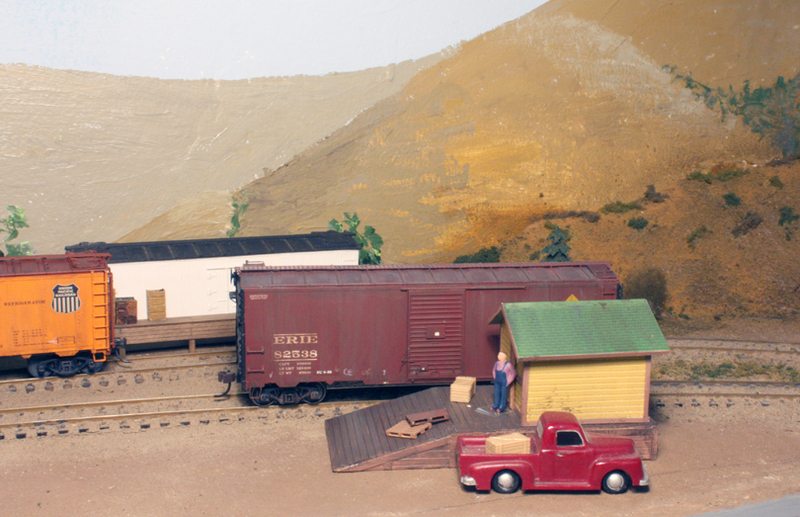 913, with a large girder load in the Pennsylvania mill gondola (this load was shown and described in a prior post, which can be found at: http://modelingthesp.blogspot.com/2018/05/still-more-open-top-car-loads.html ). Sunday we operated with a full crew of four, all experienced operators. One crew was Dave Connery and Ray Freeman (seen, respectively, at left and right below), who did the second part of the session at Ballard, as shown here. 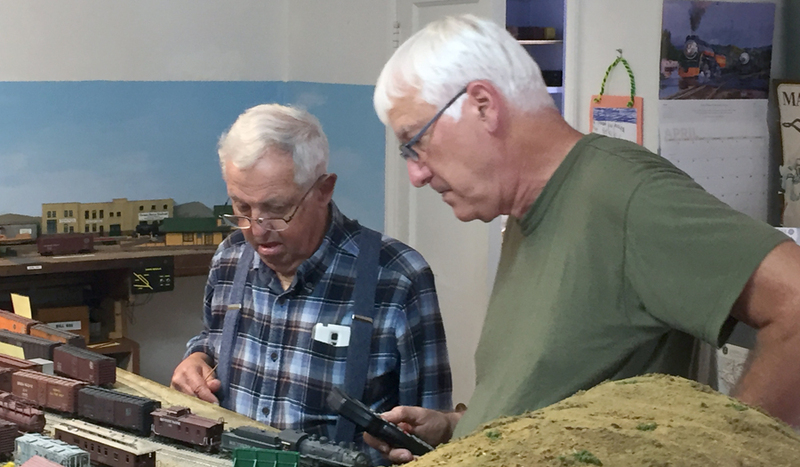 Ray is the engineer and Dave is the conductor. The changes for this session worked well, and I certainly regard them as advancements in the way the layout has been operated. Next time I can reach for still more refinements! 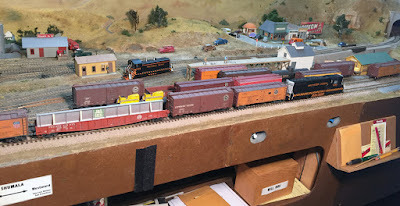 I was recently reminded of something that I had first done years ago, when I and my layout lived in Pittsburgh, PA, and sometimes visiting operators would bring equipment to include in an operating session. Essentially, all I did was tell them that the cars had to meet my operating standards (I have described my operating standards in some previous posts, particularly in this one: http://modelingthesp.blogspot.com/2011/03/model-freight-car-standards.html ), but I called my test a “rookie test,” with their car(s) as the rookie(s) in question. I will return in a moment to what that test involved, but first let me explain what brings it to mind now. I hate to mention it, but my very good friend, the late Richard Hendrickson, for all his considerable skills in researching and building model freight cars, did not actually operate them, as the layout he was building never reached operational status. The cars lived in display cases, so there was no need to think about operation. But when he came to Pittsburgh in 1989 as part of a trip to attend an RPM meet in Troy, New York, he brought along a bunch of his freight cars so they could run on my layout. 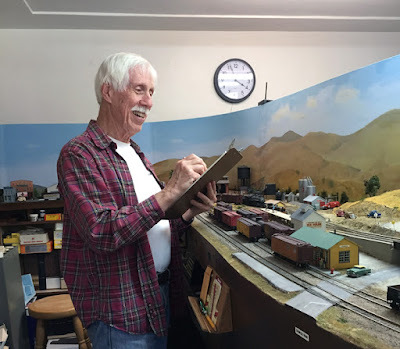 In addition, he had planned to photograph them on my layout, and the photos would be used in one of editor Bob Schleicher’s “Prototype Modeling” features in the then-thriving Railmodel Journal magazine. (It was published in the issue for January 1990, pages 10-13). All that was fine, and I was flattered to have my layout as the setting. But as they came from the carrying case, the cars were inoperable. First, most had truck screws turned down tight. 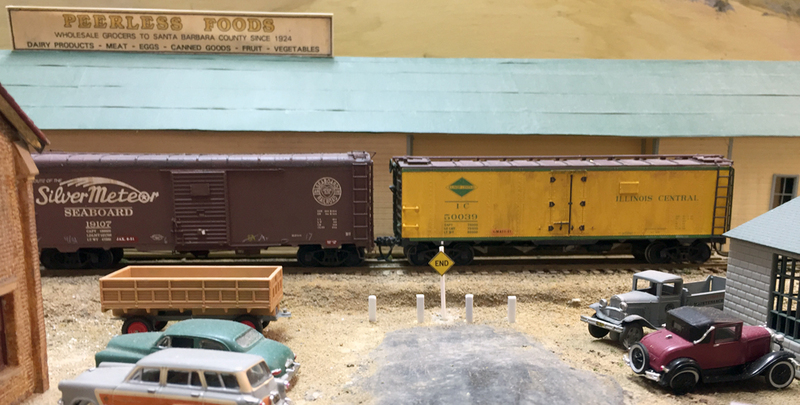 This kept trucks aligned with the long axis of the car, making them easy to take out or put into Richard’s display cases. But of course cars like that can’t operate on any but dead straight track. Second, couplers had been painted a lovely rust color, but the paint in many cases had glued the knuckles shut. 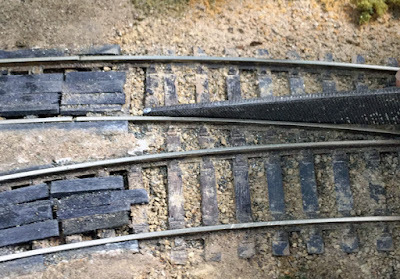 And third, most trip pins on his Kadee couplers were far too low, and would hit road crossings or even high ties on my layout. I trotted out the “rookie test” system, and most of the cars were quickly corrected and put into operation, as indeed was usually the case with other visiting operators’ cars. But what brought this to mind? 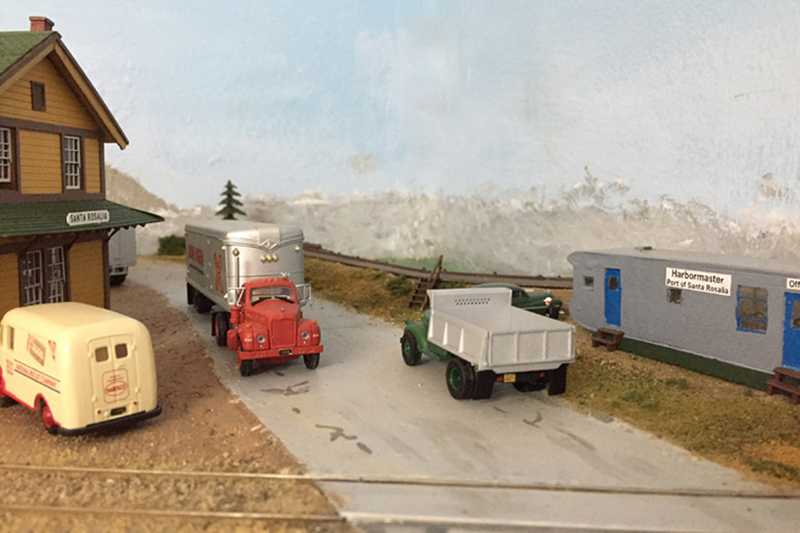 I inherited most of Richard’s freight car fleet, and there are still a few entering operation on my layout for the first time. I most certainly do exercise the rookie test on each one, to make sure it can run all right. All right, so what’s the rookie test? First, it involves checking coupler height. 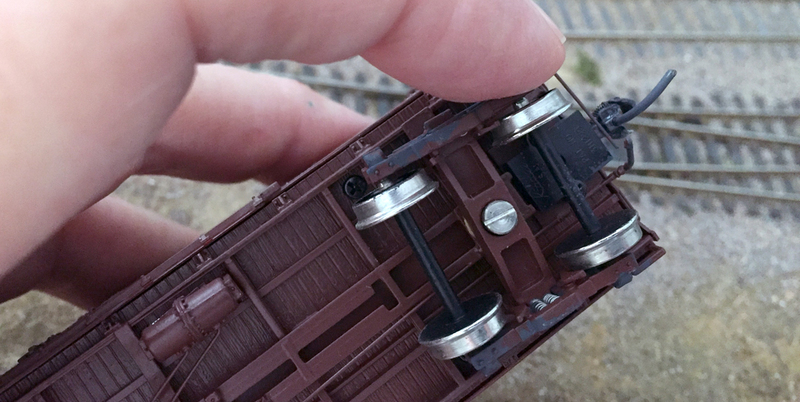 This mostly means the coupler head is at the same height above the rails as the Kadee coupler gauge. 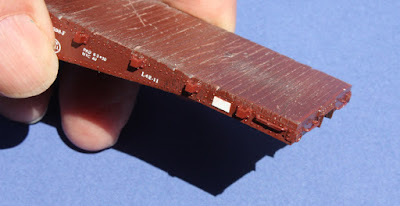 When this test isn’t met, it may mean adding a truck washer to increase coupler height, or perhaps some material removal on the body bolster or truck bolster to decrease height. But also it should mean checking the trip pin height. This height really only has to be sufficient to be above the rail head in most situations, but the shelf at the bottom of the Kadee gauge allows one to be conservative and set the trip pins a bit higher than the rail head. I usually do this. Third, and very important, couplers must swivel freely and the knuckles must freely open, and then spring back closed when released after opening. This is where paint is the culprit, as it gets into the mechanism and prevents the coupler spring from doing its job. This is not always an easy fault to fix, but touching a brush wet with paint thinner to the knuckle area usually works. Last, I check truck swing. The truck should rotate freely and be capable of wide swings. It’s easy to correct if loosening the truck screw fixes it. Of course that may not always be true, as with the brass car seen below, where shortening the spring on the truck screw may be necessary. 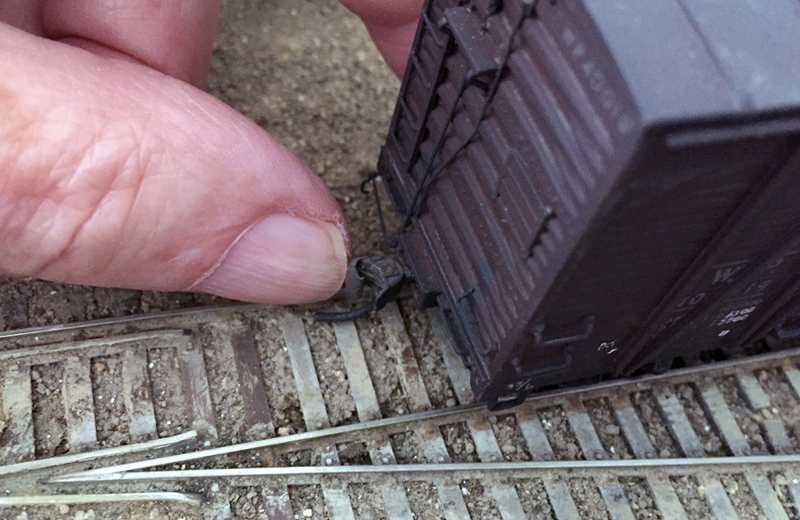 As I said above, I still use the rookie test on any car not recently operated on the layout, just to make sure. Most of my cars today are fine, but I still like to check. And I still double-check any of my Richard Hendrickson cars! Southern Pacific steam power had many distinctive features, some of which (like the cab-forward articulated locomotives) were so distinctive as to practically constitute signature power of the railroad. Lesser power often exhibited features different from other railroads, too. The one I am writing about today is the so-called “whaleback” tender. 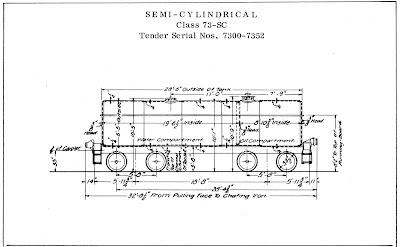 This was called a “semi-cylindrical” tender, classed as SC types by SP, and that is a good description of these half-cylinder shapes. 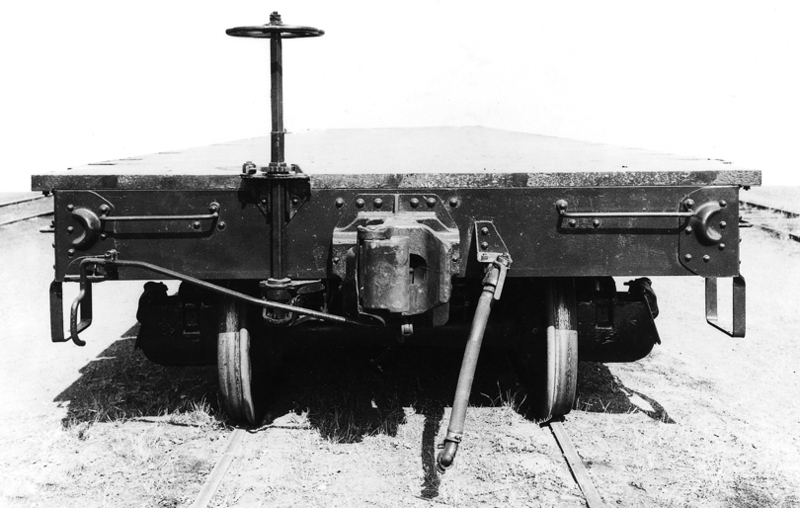 Many of the larger SC tenders were built for cab-forwards, and in later years, as some of the older cab-forwards went to scrap, were re-purposed for other locomotives. 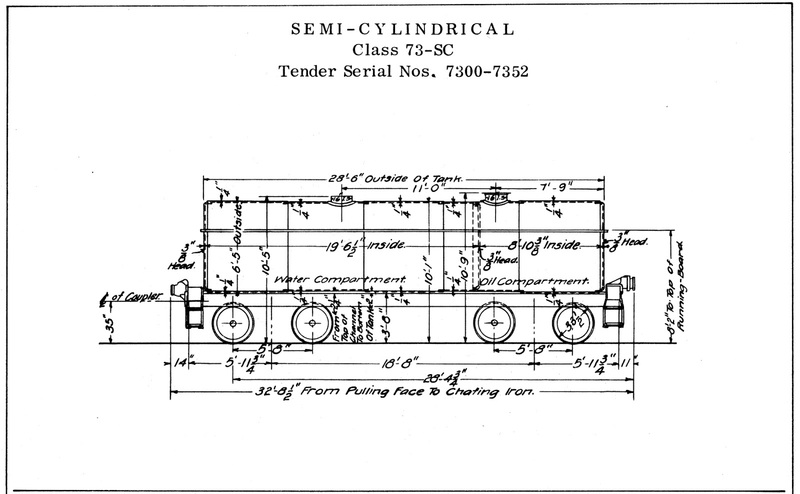 But there was a smaller class of 7300-gallon tenders that were built new by Baldwin for Consolidations in 1903. These continued in service on a range of smaller steam power in the late steam era. Photographs of these tenders in later years show a range of modifications that had happened over their lives. 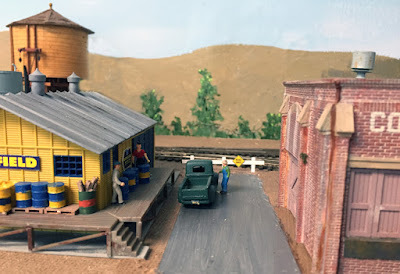 This is of particular interest to me, because I have chosen to model steam power that was assigned at San Luis Obispo toward the end of the steam era. That’s because my layout’s mythical SP branch, the Santa Rosalia Branch, would have used power from San Luis. For a number of years, there was a Consolidation assigned there, SP 2592, with one of these 73-SC tenders. It’s shown below in a Rod Crossley photo from January 1954, after my modeling era. 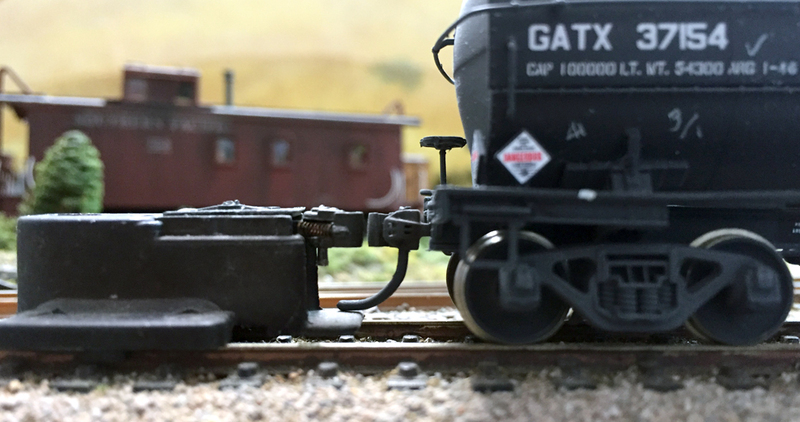 The tender appearance and lettering of my model were matched to this photo, as you see here with the engine switching in my layout’s town of Shumala. 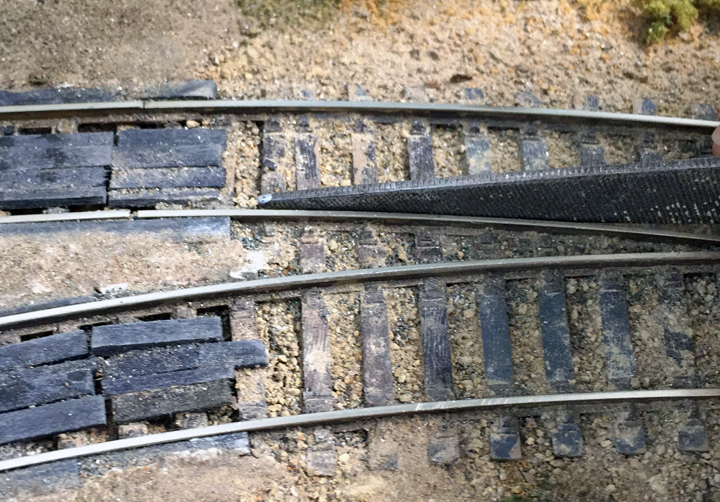 Note that my model is fairly heavily weathered, to look like the prototype SP 2592 shown above. The road name on the tender is the 9-inch lettering specified for smaller tenders after 1945, as shown in the reference book, Southern Pacific Painting and Lettering Guide (Locomotives and Passenger Cars), by Jeff Cauthen and John Signor, SP Historical & Technical Society, Upland, CA, 2013. Most of the 2500-series SP locomotives were Class C-9, one of the larger SP locomotive classes (221 engines, all from the Harriman era; UP had an additional 291 of the C-9 design). The series 2513–2599, 86 engines, were built in 1906-07. A previous group of 47 C-9 locomotives, in the series 2752–2799, had been built in 1905-06, and 26 more arrived in the numbers above 2800 in 1907. They were delivered with both rectangular and Vanderbilt tenders, but like many SP engines, swapped tenders frequently through their lives. Both my model C-9s with 73-SC tenders are in the 2500 number series. The photo above shows relatively small 9-inch tender lettering of the road name, but some of the whaleback tenders were given the post-1946 larger lettering, either 12 inches or 15 inches high. Shown below is a Francis Smith photo at Bakersfield in 1950, with Class C-2 Consolidation 2601 as the power, and the tender has the 15-inch road name. My second model with this tender type has the larger lettering, and I like the variety. This engine remains freshly painted, and still needs some weathering, though not necessarily as much as SP 2592. It is shown on the turntable at Shumala on my layout, with an SP tank car in the background delivering another load of Bunker C locomotive fuel. 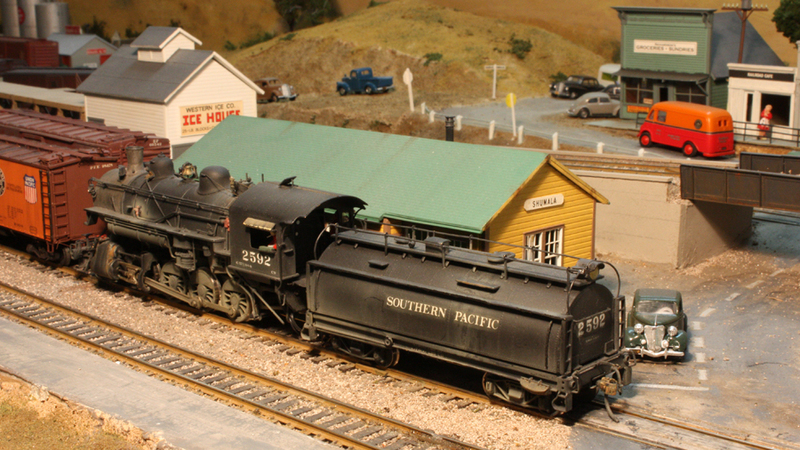 These tenders make an interesting contrast to the otherwise-ubiquitous Vanderbilt tenders of so much SP steam, and I enjoy having them on my layout. 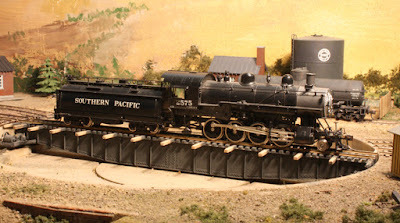 It’s an added bonus that I know at least one such tender was active at San Luis Obispo in the period I model. “1. You didn't start out a prototype modeler from day one in the hobby I suspect. How did you start out in the hobby and when did the ah-ha moment come for you that led to you being a prototype modeler? What sparked you to choose this route for your modeling? 2. Things almost never go exactly as planned. Tell us how it has gone – what do you really like about prototype modeling, and what hasn't gone like you expected? Any nasty surprises along the way? Any pleasant unexpected windfalls? 3. Any horror stories? Epic fails? Have you done any total re-dos? And also find the silver lining if you can and tell us about that. As you would see by reading each of our contributions, we all had quite different “takes” on the assignment, along with fairly different backgrounds and trajectories through modeling. My own comments would likely sound generally familiar to anyone who reads much of this blog. In this view, the rails in the foreground are almost at the end of the branch. The “assignment” we were all given was a thought-provoking one, and I enjoyed the chance to look back and reflect on how I’ve gotten to where I am today, with prototype modeling. 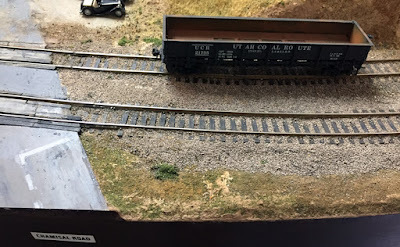 As my essay explains, I have for some years aimed at layout operation that is both prototypically accurate and also interesting for visiting operators. I think I’m getting there.